A celebrated tapas bar from Florida is headed to Texas. 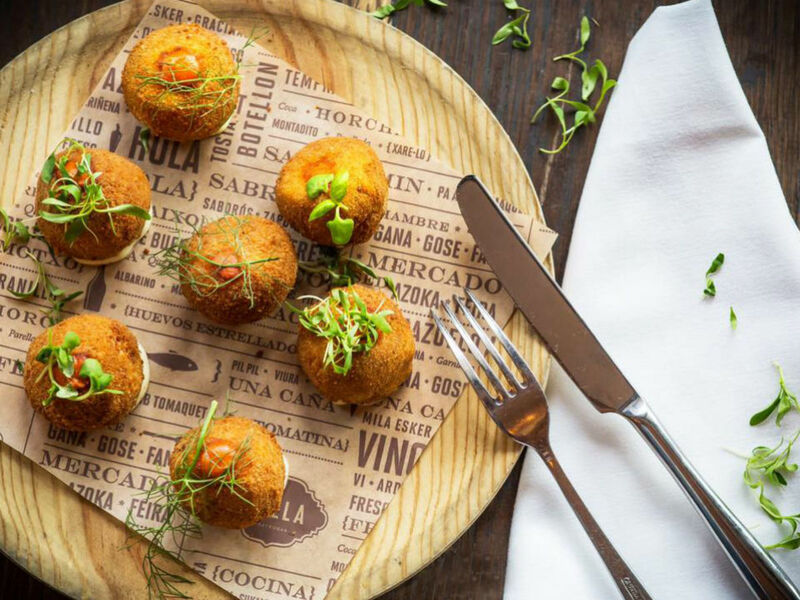 Called Bulla Gastrobar, it's a small restaurant chain born in Coral Gables, Florida, where it's acclaimed for its authentic Spanish-style tapas and fun atmosphere. The first branch in Texas will open in Plano, at the ever-expanding Legacy West development, nestled right next to the Renaissance Dallas Plano Hotel, the new hotel project from the Sam Moon Group. Pronounced "boo-ya" and said to be Spanish slang for chatter, Bulla is the brainchild of Florida restaurateur Carlos Centurion, who was inspired by popular tapas-style restaurants in Spain. It serves unique Spanish and Catalan dishes, with the action centered around a convivial bar. The original location in Coral Gables opened in 2013, followed by three more branches in Florida. There are three new locations in the works, including one newly opened in Atlanta, Georgia, another opening in September in Tampa, and Plano. According to a staffer from the chain, construction is just beginning, and the restaurant is set to open in early 2018. Bulla's menu includes such Spanish specialties as paella and arroz caldoso, along with braised short ribs, truffle carbonara, Iberian pork tenderoin, and skirt steak marinated with cumin and served with sweet potato terrine. Small plates include tapas classics such as octopus salad, gazpacho, chicken croquettes, and patatas bravas, along with less tapas-y dishes like kale salad and foie sliders. There are cured meats including Serrano ham and Spanish sausage, and Spanish cheeses, both obvious options like manchego and less-obvious ones such as Idiazabal sheep’s milk cheese that’s been smoked. Dallasites are not unfamiliar with the chain. The Bachelorette Rachel Lindsay and Bryan Abasolo were recently spotted at the Coral Gables branch, celebrating a birthday. Bulla is part of the Centurion Restaurant Group, with sibling concepts that include Pisco Y Nazca, a ceviche gastrobar, and Beehive Kitchen, a quick-serve healthy restaurant where you build your own bowls. The Renaissance opens on September 8. The 15-story hotel resides within the walkable epicenter of the $3 billion Legacy West urban mixed-use project, poised to bring a unique blend of hospitality sizzle and zen to the progressive, recently opened development that boasts the North American headquarters of Toyota, United States headquarters of JC Penney and Frito-Lay and the regional headquarters of FedEx Office. The list of restaurants and shops at Legacy West is long, including Barnes & Noble Kitchen, Bonobos, Coach, Del Frisco's Double Eagle Steak House, Earls Kitchen+Bar, Fabletics, Fidelity, Filson, Frontgate, Haywire, J Crew, Johnny Was, Levi's, MAC, Madewell, Mesero, North Italia, Peter Millar, Pockets, Sephora, Shake Shack, Sprinkles, Sugarfina, Suitsupply, Taverna, Toulouse, Tesla, Tommy Bahama Store & Restaurant, True Food Kitchen, Tumi, Venetian Nail Spa, Warby Parker, and West Elm.